Back in May we wondered if the Profiles in History auction for Steve McQueen's Le Mans Memorabilia would set new pricing records. The results are in and they're actually a bit mixed. While some items sold well over auction estimates, others sold right at estimate or didn't sell at all. 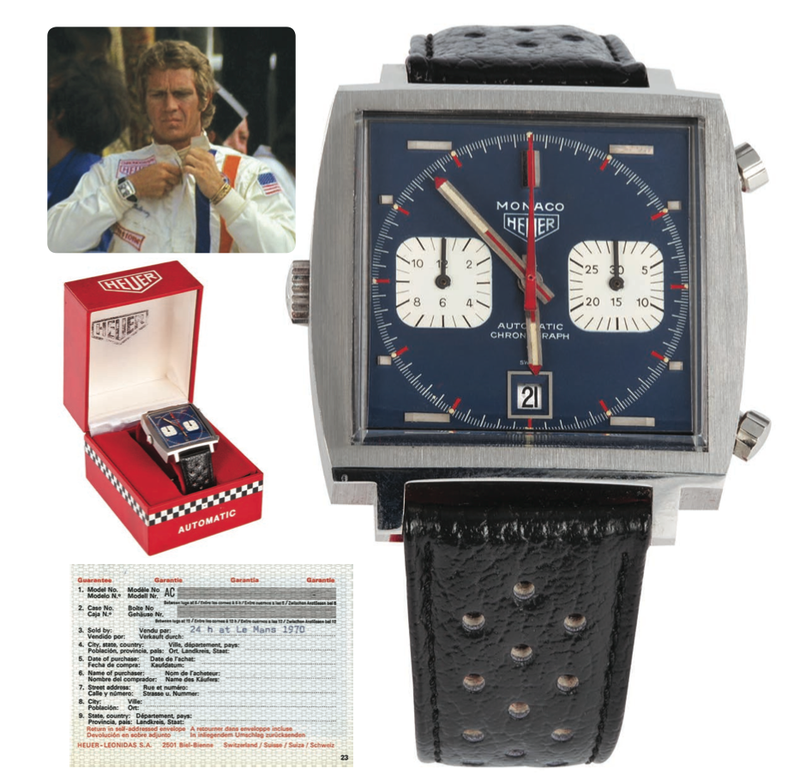 Perhaps the most highly anticipated item up for auction was the Heuer Monaco watch worn by McQueen during the filming of Le Mans . Of the four watches delivered to the set, this particular watch's provenance is said to be "iron clad" with a notarized letter from the movie's prop-master testifying to the fact that it was worn by McQueen. The last time one of these McQueen Heuer Monaco watches sold at auction it fetched $87,600. The pre-auction estimate for this watch was $200,000 to $300,000. The actual price realized was more than double the high-end estimate at $650,000 (we've seen other reports stating $799,500 but paper work on the auction house's web-site states different; it's item 663). The Steve McQueen Gulf Racing Jacket estimated to sell between $80,000 - $90,000 was either withdrawn or didn't sell. A signed publicity photo of McQueen from Le Mans sold for $3,000 - $500 more than the high estimate of $2,500. McQueen's signed US Passport used during the filming sold for $37,500 - way over the pre-auction estimates of $15,000 to $20,000. McQueen's vintage Silver King Velodrome track bicycle estimated to sell between $20,000 and $30,000 was either withdrawn or did not sell. The Heuer "Twin Set" stopwatches estimated at $40,000 to $60,000 were either withdrawn or did not sell. Steve's personal Bell motorcycle helmet realized $8,000 - on the low end of the $8,000 to $12,000 estimates but still good money. The "Michael Delaney" Team Gulf rain jacket worn by McQueen in the film was estimated to sell between $80,000 and $100,000. According to the auction results it was either withdrawn or didn't sell. There were a few other items, but those mentioned above make up the bulk of what was offered. Apparently McQueen can still command cash for certain items, but expectations may have been too high for the jackets and other big ticket items. For more information check out the results for yourself on the Profiles in History web-site. Will Brad Pitt Play Steve McQueen in the Upcoming Biopic?